Notches Pattern Shop is a Retail Stockist for Jalie Sewing Patterns. 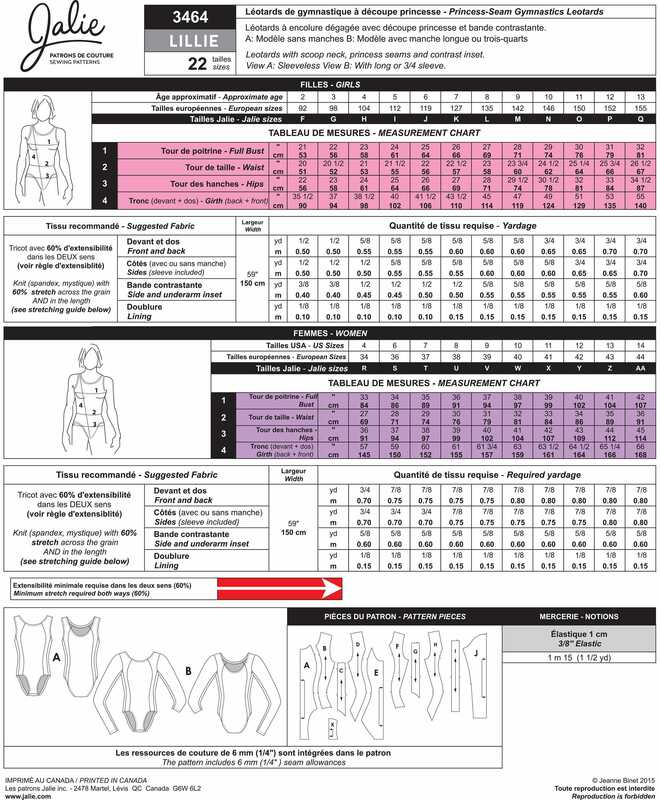 Package includes patterns and instructions to make leotards with scoop neck, princess seams and contrast inset. View A: Sleeveless. View B: With long or 3/4" sleeve. Great leotard sewing pattern for Gymnastics Practice and Competition routines! Pattern Condition: UNCUT, factory folded paper pattern in sealed plastic sleeve. Printed in French and English. Listing Photos provided represent pattern design; pattern you will receive. Listing provided is for a sewing pattern, not a completed item. Notches Pattern Shop’s inventory includes sewing patterns from the 1980's to present day. Sewing patterns are UNCUT, factory folded, with original instruction sheets in the original pattern envelope. Pattern envelopes are in Good to Excellent condition. Some pattern envelopes may have a small tear, wrinkle(s), or slight discoloration due to age and/or shelf wear. If the pattern envelope has more than a minor defect, the defect will be detailed in the Item Description. NEW STOCK Listings provide photos of the design; sewing pattern you will receive. New Stock Listings are NEW & UNCUT sewing patterns received directly from the designer/vendor. It's important to note that sewing pattern sizes are not identical to retail sizes and standardized sizing varies from pattern brand to pattern brand. Please read the "Item Detail" carefully and refer to Sizing Information on the pattern envelope for additional information. Every effort is made to accurately represent the sewing patterns sold at this site. Please read the "Item Detail" carefully & refer to the listing photos. Contact me with any questions prior to purchase. Refunds will only be considered if a sewing pattern(s) is misrepresented and you contact me within 3 days from receipt/delivery of sewing pattern(s). Shipping costs are not refundable. Otherwise, all sales are final. •Notches Pattern Shop ships to US destinations and Select Countries. •Packages are shipped through USPS First Class Mail within 1 – 2 business days of receiving payment verification. USPS Tracking is provided for US destinations; not available for all Countries. •To International Buyers: It is the buyer’s responsibility to pay any customs fees, import duties, and taxes. •Every effort is taken to provide you, the Buyer, with affordable shipping costs. Shipping costs vary depending on pattern size and destination. Discounted shipping costs are provided on multi-pattern purchases. New York State residents will be charged 8% sales tax at checkout. From purchase to delivery of the pattern and the instructions very clear, I am super happy.